A few minutes walk from downtown Gion. It is a quiet world away from the hustle and bustle. "Shikinean Gion Shirakawa" beside the Shirakawa flowing in the middle of the antique street that represents Japan is able to enjoy the four seasons of Kyoto, cherry blossom in the spring, fireflies in the summer, autumn leaves in the autumn, snow scenery in the winter. Shirakawa's flow, enjoying the views of the willow and brook of Kyoto scenery, has been popular with writers and artists since ancient times. Enjoy the culture of Gion and the life of Kyoto, inheriting the tradition of Japan. Guest rooms handled by Hiroyuki Wakabayashi, a representative architect of Kyoto, are elegant room that boldly constituted the Japanese minimal space while expressing the delicacy of Japan. The designer of our building is known as the directer of "Nankai Train Rapit", "Humax Pavillion Shibuya", "Keihan Uji Station", "Kyoto pickles Nishiri company building" and etc. The furnishings have all been carefully selected for your comfort and convenience. There are a number of artworks and items in the room, such as Jakuchu Ito, Kitaoji Rosanjin, Oukyo Maruyama, Galle, Lalique, Natural treasure Yakusugi table, Horiki Eriko's Japanese paper screen, contemporary art, etc. Enjoy a genuine piece of art in love while exploring the good old city. soft drinks and mineral water are available free of charge in the refrigerator. Enjoy the choice of matcha, green tea, coffee and tea. We are looking forward to welcoming you with the best quality and convenience. 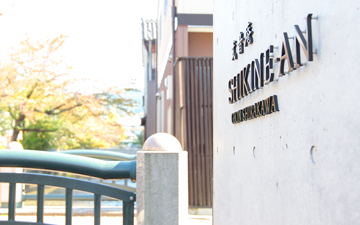 Yasaka Shrine is located in the place that is 10 minutes away from Shikinean. The shrine used to be called Gion-sha before the Meiji era and possessed a large-scale land containing Kamo River. This area was called Gion for that reason. Gion was formerly known for its Geisha town where Geisha and apprentices worked. Today in this area, there are many famous restaurants, tea houses, and the Kabuki theater called Minamiza that inherit the traditions of old Kyoto. 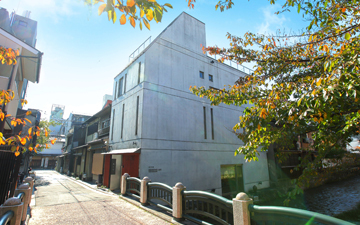 The north of Gion, which stretches from Shinbashi Street to the Shirakawa River has been selected as one of the Important Preservation Districts for Groups of Historic Buildings. 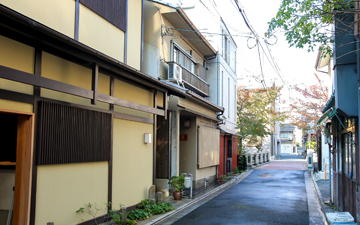 The southern area around Hanamikoji Street has been designated as the Historical Landscape Preservation and Improvement District. The preservation and use of traditional cityscape have been in progress in recent years. Copyright © 式音庵 祇園白川 All rights Reserved.